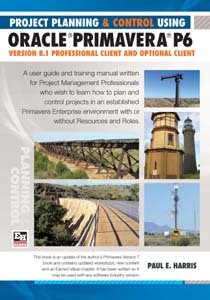 The latest software for planning & scheduling professionals is Primavera® P6TM and the latest available training manual for P6 is “Project Planning & Control Using Primavera® P6 TM” by Paul Eastwood Harris. P6 is not easy to use due to its deep and complex capabilities and feature set, it requires training and this book is the best product to use. It is written by an experienced scheduler and P6 user, not an IT person, and it is written for the P6 student who understands how to manage projects but needs to learn how to use the software. This P6 training manual is a new compendium of tools, techniques, tips, and traps to using Primavera’s latest software package. Harris has continued his tradition of writing clear and user-friendly books to help the planner/scheduler learn and use scheduling software effectively and efficiently. Using his successful format from his previously published manuals for Microsoft Project, P3, SureTrak, and Primavera Contractor, Harris covers the bulk of P6’s feature set by flattening and shortening the steep learning curve of this complex software package. I have used Harris’ books in my company’s project management training classes for years because of his clear writing style, the depth of feature coverage, and the ability to use the book as a reference book in day-to-day use. “Planning & Control Using Primavera® 6.0” guides the student/user through a logical sequence of understanding the principles of project management, the steps required to set-up a project, and those required to update and maintain a project. Due to the complexity and feature set of P6, Harris’ book is designed to be used in a 3-day training class. Buy the “Project Planning &Control Using Oracle® Primavera® P6 Version 8.1 – Professional Client and Optional Client” Training Manual Now!